The Wisconsin Ready Mixed Concrete Association is accepting through month’s end entries for its 33rd Annual Concrete Design Awards, showcasing the best examples of cast-in-place concrete in Wisconsin and Michigan’s Upper Peninsula (UP). WRMCA, County Materials Corp. and the Wisconsin Chapter of ACI International are cosponsoring the awards program, with entries judged by a panel of educators and construction professionals. The program recognizes excellence in Agricultural, Commercial, Decorative Commercial, Decorative Residential, Education, Healthcare and Public, Environmental Management, ICF, Industrial, Municipal Facilities, Municipal Infrastructure, Overlays, Parking Lot, Pervious, Residential and Tilt-Up categories. Portland Cement Association has named recipients in three 2014 John P. Gleason, Jr. Leadership Award categories: Business Continuity, Jacqueline Clark, APR, Fellow PRSA of Ash Grove Cement Co.; Market Development, Tim Kuebler of Titan America; and, Young Leaders, Corey Zollinger of Cemex USA. Presented at PCA’s fall committee meeting in Chicago, the awards honor employees of member companies who have exhibited industry leadership by steering the Association in new directions. PCA is now offering free PDFs of two benchmark titles, Simplified Design of Concrete Buildings and Notes on ACI Building Codes—both revised and updated according to the ACI 318-11 code. Both present time-saving analysis, design, and “how to” methods for construction of reinforced concrete buildings. The fourth editions include updated equations, design aids, graphs, and code requirements. The 900-page Notes on ACI Building Codes suits educators, contractors, materials and product interests, building code authorities, inspectors and others involved in the design, construction and regulation of concrete structures. By incorporating discussions of the history and philosophy of concrete design, it strives to inform the reader of both the “letter of the law” and also the “spirit” behind the code provisions. 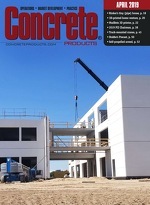 Files of both titles are posted in free PDF versions at www.cement.org. CTLGroup has named Hamlin Jennings, PhD, affiliated consultant, specializing in cement chemistry, cementitious composite microstructural characterization, concrete durability, plus creep and shrinkage mechanisms. Dr. Jennings’ work includes forensic investigations, product development, and applying new technologies for characterizing cement and concrete behavior. Outside CTLGroup, Skokie, Ill., Jennings is an adjunct professor in the Massachusetts Institute of Technology Department of Civil and Environmental Engineering and principal investigator at the Cambridge campus-hosted Concrete Sustainability Hub, where he served as charter executive director, 2009–2013. CTLGroup has announced a strategic alliance with Houston-based foundation and geotechnical consulting specialist Cibor Geoconsultants to pursue complex engineering and materials science projects throughout the U.S. and globally. A particular focus will be serving private and public clients in the infrastructure, energy, and oil & gas sectors. CTLGroup and Cibor staff will address problems for clients in forensic geotechnical engineering, cement based materials, structural assessment and structural health monitoring. Concrete Reinforcing Steel Institute has named Greg Halsted its Western Region manager, responsible technical, educational, promotional and membership activities on both national and regional chapter levels throughout the Western U.S. and Canada. He was previously Pacific Northwest/Western Canada manager and has supported the Western Region through his knowledge of engineering and promotional activities since 2012. He also heads the continuously reinforced concrete pavement initiatives at CRSI, working directly with the Federal Highway Administration. Prior to the Institute, he was Portland Cement Association market manager, responsible for the design and construction technical services assistance, marketing, and promotion of all cement-based pavement materials; and, Georgia Department of Transportation technical services manager. CRSI has also added Jose Mendoza as the Pacific Southwest manager, supporting Halsted on a regional and local basis, as well as advancing national promotional goals. He joins the Institute after 16 years with Hilti Inc., in which he supported and promoted to the design and construction community through technical presentations and strategic business/partnership development. He is a registered Professional Engineer in California, Nevada and Arizona, and knowledgeable of Caltrans and California inspection agencies. The Post-Tensioning Institute is accepting through December 31 entries for the 2015 Project Awards program, honoring excellence and innovation in post-tensioning applications. Project owners, architects, engineers, contractors, and post-tensioning suppliers are invited to submit projects, completed since 2007, that use post-tensioning as a structural component in these award categories: Bridges, Buildings, Industrial/Special Applications, Parking Structures, Slab-on-Ground, plus Repair, Rehabilitation, and Strengthening. The official entry form can be downloaded here. In January 2015, a jury of industry professionals will evaluate award submittals based on creativity, innovation, ingenuity, cost effectiveness, functionality, constructability, and aesthetics. Members will select an “Award of Excellence,” followed by one or two “Awards of Merit” in each category, plus a “Project of the Year.” Winning projects will be honored during the 2015 PTI Convention, April 26-29 at the Royal Sonesta Galleria Hotel in Houston. The call for entries, submission details and 2013 PTI Project Award winners can be viewed at www.post-tensioning.org.